Posted on Wed, Jun 23, 2010 : 11 a.m.
Photo: Sheri and Dr. Nathan Krinsky, courtesy University of Michigan Press. Paul Gross, the WDIV Channel 4 staff meteorologist, has a new book out called "Extreme Michigan Weather" that was published by the University of Michigan Press. In it, he gives a history of some of the most substantial weather events in the state. Today's weather links look at some of the state's weather extremes, including two furious storms of the 1910s. The first chapter of the book is online for you to review and comment on. The publisher is using Digress.it, a plugin for the WordPress blogging tool that allows you to add a comment to each paragraph of the text. The book tour for the book is being coordinated with the help of a Facebook page, with announcements of author events and signings. "The Great Lakes Storm of 1913, also called the "White Hurricane" by some. This massive "gale of November" generated hurricane force winds over Lake Huron for twelve straight hours, and sank eight freighters, killing over 200 seamen...still one of the worst maritime disasters in American history. Meteorologist Mal Sillars and I researched the meteorological history of that storm, and it was tremendously interesting to hand plot the weather maps from copies of the original November 1913 surface weather observations." More info on this storm can be found inÂ Michigan in Pictures, which includes photos of boats overturned by the storm. The National Weather Service account gives the meteorology, and Tales of Riverside has a catalog of ships lost in the storm. An audio interview with the author is available as a podcast. Almost half of the book is a daily chronicle of high and low temperatures and maximum rainfall and snowfall for cities throughout the state. The author transcribed 30,000 individual statistical observations from long running weather stations around the state, and notes that many errors were located and corrected along the way. The book, which took three years to write, justifies itself in my eyes as the work of a scholarly press by its careful attention to these details. The Ann Arbor data presented here shows a record high for June 23 of 96 degrees, and a record low of 39 degrees. The maximum precipitation for this day, based on records since 1880, is 2.93 inches. The first day of the fall with measurable snowfall beyond a trace is October 12, which saw 0.5 inches of snow one year. 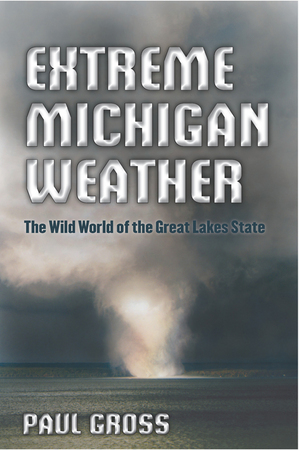 Any book about Michigan weather covering over 100 years of history won't have a story about every event. The June 1917 tornado that hit Calhoun, Jackson, Ingham and Washtenaw counties is one where I can't tell the story end to end. It hit Rogers Corners, damaging the Zion Lutheran Church. It wiped out the Sharon Township Hall, and the church there relocated to Manchester. The tornado then clobbered the mill town of Delhi so hard that it never really recovered. The Delhi Bridge Local Historic District Report (PDF) gives some of the history of the impact of that event on Delhi, including a fragment of the story that the local chapter of the American Red Cross was created in response to the event. What I don't have is a nice clear end to end story of the impact of that storm on the local area. Wed, Jun 23, 2010 : 1:29 p.m. Thanks for the heads up! I want this book...can't wait! Paul Gross is an amazing scientist...wish he was on WDIV more often. I don't care about pretty faces I want the weather facts...just the facts, maam, just the facts. Wed, Jun 23, 2010 : 10:19 a.m.
That sounds fascinating! I'm going to look into that book.